The entire Kerry Way is signposted by marker posts, which generally speaking (but not always) are clearly visible. However, it is unwise to embark on the route without a good Guide Book which combines a series of clearly laid out maps, compiled to a known scale, and related descriptive text. 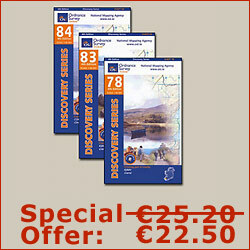 Maps numbered 78, 83 and 84 in The Discovery Series produced by Ordnance Survey Ireland to a scale of 1:50,000, provide a broader topographical picture of the greater part of the route. There is 1km of the Kerry Way on Map 70 between Mountain Stage and Kells and there is also 2km of trail on map 85 between Templenoe and Kenmare. Best mountaineering practice recommends carrying a navigation compass (presuming you have the ability to use it correctly!) 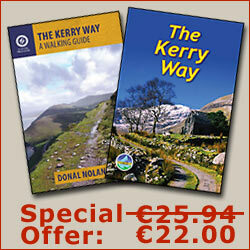 on all hiking expeditions and the Kerry Way is no exception. Mobile phone reception is best on high ground but difficult to get in valleys, therefore regard a phone as an optional extra; useful for contacting your upcoming accommodation in the event of unexpected delay, or in the event of a real emergency (and only in such circumstances) Mountain Rescue.